Leo IX, Roman Catholic Pope from 1049 to 1054, was a native of Upper Alsace, where he was born on the 21st of June 1002. His proper name was Bruno; the family to which he belonged was of noble rank, and through his father he was related to the emperor Conrad II. He was educated at Toul, where he successively became canon and (1026) bishop; in the latter capacity he rendered important political services to his relative Conrad II, and afterwards to Henry III, and at the same time he became widely known as an earnest and reforming ecclesiastic by the zeal he showed in spreading the rule of the order of Cluny. On the death of Damasus II, Bruno was in December 1048, with the concurrence both of the emperor and of the Roman delegates, selected his successor by an assembly at Worms; he stipulated, however, as a condition of his acceptance that he should first proceed to Rome and be canonically elected by the voice of clergy and people. Setting out shortly after Christmas, he had a meeting with abbot Hugo of Cluny at Besançon, where he was joined by the young monk Hildebrand, who afterwards became Pope Gregory VII; arriving in pilgrim garb at Rome in the following February, he was received with much cordiality, and at his consecration assumed the name of Leo IX. One of his first public acts was to hold the well-known Easter synod of 1049, at which celibacy of the clergy (down to the rank of subdeacon) was anew enjoined, and where he at least succeeded in making clear his own convictions against every kind of simony. The greater part of the year that followed was occupied in one of those progresses through Italy, Germany and France which form a marked feature in Leo's pontificate. After presiding over a synod at Pavia, he joined the emperor Henry III in Saxony, and accompanied him to Cologne and Aix-la-Chapelle; to Reims he also summoned a meeting of the higher clergy, by which several important reforming decrees were passed. At Mainz also he held a council, at which the Italian and French as well as the German clergy were represented, and ambassadors of the Greek emperor were present; here too simony and the marriage of the clergy were the principal matters dealt with. After his return to Rome he held (29th April 1050) another Easter synod, which was occupied largely with the controversy about the teachings of Berengar of Tours; in the same year he presided over provincial synods at Salerno, Siponto and Vercelli, and in September revisited Germany, returning to Rome in time for a third Easter synod, at which the question of the reordination of those who had been ordained by simonists was considered. In 1052 he joined the emperor at Pressburg, and vainly sought to secure the submission of the Hungarians; and at Regensburg, Bamberg and Worms the papal presence was marked by various ecclesiastical solemnities. After a fourth Easter synod in 1053 Leo set out against the Normans in the south with an army of Italians and German volunteers, but his forces sustained a total defeat at Astagnum near Civitella (18th June 1053); on going out, however, from the city to meet the enemy he was received with every token of submission, relief from the pressure of his ban was implored and fidelity and homage were sworn. From June 1053 to March 1054 he was nevertheless detained at Benevento in honorable captivity; he did not long survive his return to Rome, where he died on the 19th of April 1054. 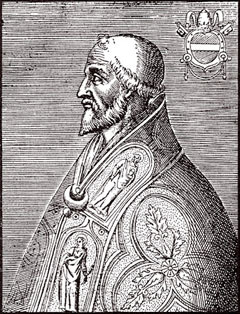 He was succeeded by Pope Victor II.